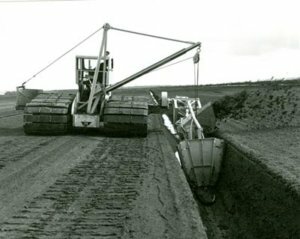 This attachment is used to remove slurry from the bottom of milled peat field ditches and dispose of it by spreading it on the adjacent field. The attachment is a screw elevator with radial blades fitted at the top to eject the spoil through an outlet in the casing in a predetermined direction. The attachment is mounted on a cantilevered bracket from the tractor on a pivot arrangement so that the screw casing may be lifted and lowered as required by winch rope. In the working position the screw elevator is lowered into the ditch, inclined forward at the support bracket and is drawn along in this position. The elevator has a cylindrical casing, the extreme lower end extending slightly beyond the screw, is formed to scoop the slurry from the bottom of the ditch as the tractor advances. The front of the casing is open, exposing the lower part of the screw and scoop. Externally, the casing is fitted with spring side wings, with their shape conforming to the profile of the drain. At the discharge end, radial blades are housed in an expanded section of the casing with a tangential outlet directed away from the machine. The drive to the screw is from the side P.T.O. of the Bord na Móna tractor, by cardan shaft, V-rope drive, bevel gear reduction box and universally jointed drive shaft to the screw. As the tractor progresses along the ditch or drain it accumulates the slurry; the screw elevates it into the discharge chamber and the radial blades eject it through the outlet onto the peat field. A different attachment was needed to cut the smaller drains - Read about the Cross Drain Cutter. facebook Created with Sketch. youtube Created with Sketch.